Having trouble picking a flavor? 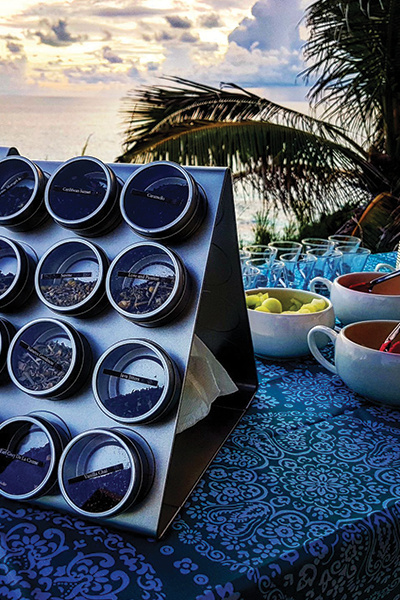 Use our mood-o-meter tea cups to help you find a flavor. 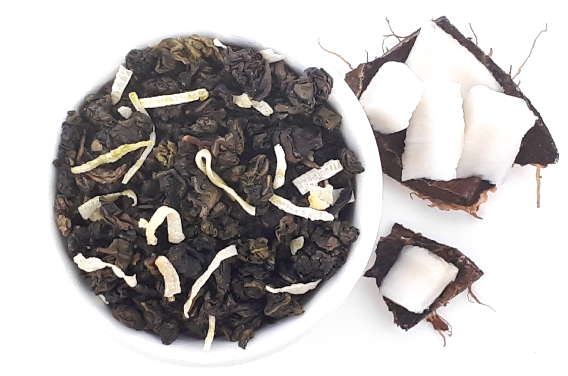 We are nuts about Coconut Oolong! 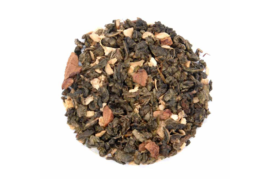 This invigorating blend infuses a premium Taiwanese Oolong with rich and creamy coconut flakes. A fantastic choice for an afternoon respite, or anytime you need a pick-me-up. Ti Kwan Yin Oolong, Coconut Flakes, Coconut Flavoring. Dairy Free, Gluten Free. Suitable for Vegetarians and Vegans. Made in a Factory that Handles Nuts. Who doesn’t love a carnival right? 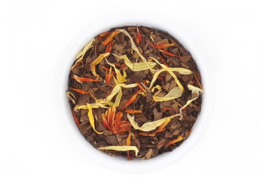 Our Carnival Maté Tea is just that, a carnival for your tastebuds. The smooth blend of Yerba Maté, with hints of creamy caramel and marigold are to die for. This tea is a fan favorite. A super charged, healthy version of everyone’s favorite juice. 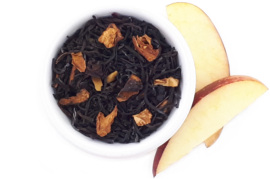 Tangy cranberries and luscious apple make our Cran-Apple Black Tea a people pleaser. If you’re looking for some juicy berry sweetness, this is the tea for you. Dried super-fruit pieces give this tea lively, fresh and fruity tones. 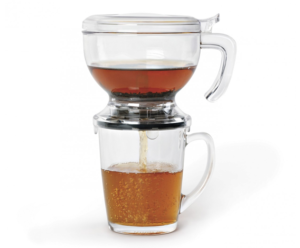 A great base for tea cocktails! There’s nothing quite so comforting as the scent and taste of warm, spiced apples on a cold day. 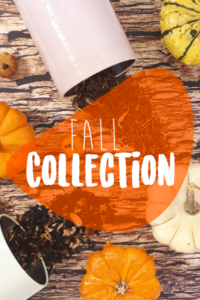 This Apple Cider blend features organic oolong combined with sweet apple and a touch of spicy ginger to give a refreshing lift to your cup. Cozy up and enjoy this soothing and warming tea! 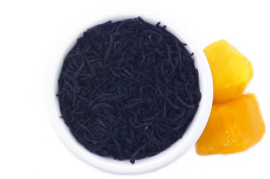 A sweet and dark blend of the highest quality Ceylon Black Teas flavored with the enticing taste of perfectly ripe tropical mangoes. Not to be missed, this tea provides a creamy but dry finish with powerful floral aromas and fruity sweetness. 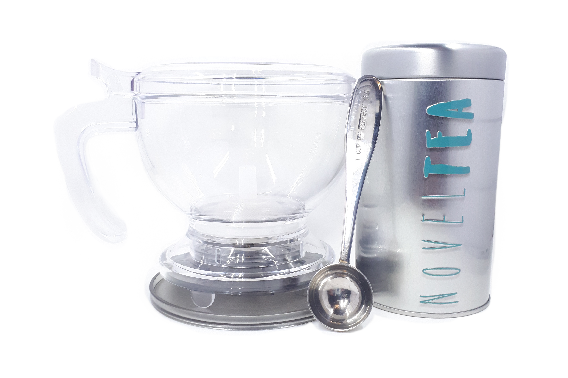 Discover the wonderfully diverse world of tea, with NovelTea. 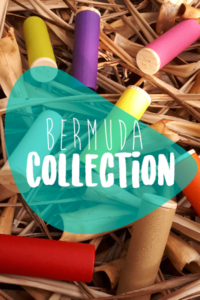 Bermuda’s Premium Loose Leaf Tea Shop with a passion for really great tasting tea. Tea makes us happy. You will be too.